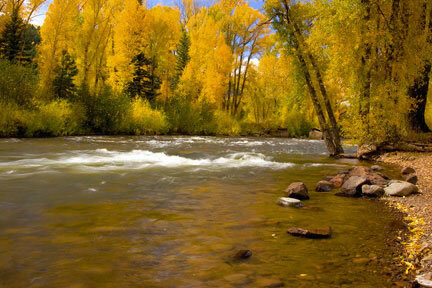 into the Rio Grande in northern New Mexico the Canejos River is an outstanding fly fishing fishery for Rainbow Trout and Brown Trout. Colorado highway 17 from Antonito provides almost 25 miles of easy access to the Conejos. Forest Road 250 then weaves along the Conejos nearly 25 miles to Platoro Reservoir. 6000 acre Platoro Reservoir near Platoro, Colorado has great fishing, camping, hiking, back packing canoeing and boating. Fly Fishing Rainbow Trout on the Conejos River in Southern Colorado and Northern New MexicoAnglers have a good choice of comfortable accommodations on the Conejos at Antonito and Platoro. A good number of Fly Fishing Lodges and Guest Ranches to choose from. By car you can reach the Conejos in an hour from Taos, New Mexico, 2 hours from Santa Fe and 3 from Albuquerque. Depending on snow pack, the flow will be low enough for good fly fishing in early June and continue good through October.